One miner more than any other excavates shareholder wealth from company coffers for the benefit of its chief executive. Digging deep into the bowels of executive pay, shareholder activist group As You Sow has found one miner excavates shareholder resources more than any other. Photo: Flickr via Loco Steve. On one hand, a strong argument can be made for free markets determining appropriate executive compensation levels, while on the other a long list of companies squandering shareholder resources by lavishing CEOs with outsized pay and stock awards cries out for reform. Shareholder activist group As You Sow says it's up to investors themselves to stake out a middle ground and hold CEOs and boards of directors accountable for how companies are spending their money because its study of executive compensation shows there is virtually no correlation between CEO pay and shareholder returns. That divergence may be most evident in the mining industry where the collapse of commodity prices has led to dismal operational and financial performance of mining companies along with the degradation of the value of their stock, yet the executives continue to be well-rewarded. Rio Tinto (NYSE:RIO) has come in for criticism over the years for heaping excessive amounts of compensation on its executives despite a record of poor decision-making. Its purchase of Alcan in 2007 for $38 billion, for example, destroyed huge sums of value, loaded the miner with debt, and inhibited its ability to make future acquisitions. Yet CEO Tom Albanese was given a huge raise in 2011 despite Rio Tinto having to writedown some $30 billion in assets. Shareholder protests ultimately caused him to pass on the bonus the board awarded him,, and he was ultimately ousted in 2013 in favor of Sam Walsh, who was immediately given a 44% pay raise. Rio Tinto felt it was necessary to spend 17% of its time in its 2013 annual report -- 41 pages out of 244 total -- justifying the compensation it bestowed on its executives. Yet not even Rio Tinto is the poster child for miners overpaying their CEO. As You Sow sought to quantify the apparent growing disparity between what could be considered fair and reasonable compensation and simply turning the keys to the treasury over to the executive, and the result was The 100 Most Overpaid CEOs, a compilation of the worst offenders, or the companies who've abused the trust shareholders have placed with them and their boards of directors. Topping the list was oil industry services specialist Nabors Industries (NYSE:NBR), which doled out more than $68.2 million in total compensation on CEO Anthony Petrello. The shareholder activist group noted Nabors investors suffered net losses of 21% over the five-year period ending in December 2013. Had Petrello's pay been linked to performance, a simple linear relationship would have seen his compensation total around $11.2 million. In reality, though, it was more than $68.2 million, or a $57 million divergence in "excess pay" during the period studied. So, this isn't simply a list of who got paid more. Oracle's Larry Ellison, for example, reaped over $78 million in pay, but came in second (though he was paid $66.5 million more than he should have been based on performance). His compensation, though, has often been a lightning rod for controversy. Rather, As You Sow combined statistical analysis with an in-depth look at over 30 "red flag" indicators, such as returns on assets and invested capital, stock option and equity grants, pay above peers, sustainability, and third-party rankings from organizations like Institutional Shareholder Services and Glass Lewis. There's veritable gold rush at some companies to line the pockets of executives at the expense of shareholders and even the company. 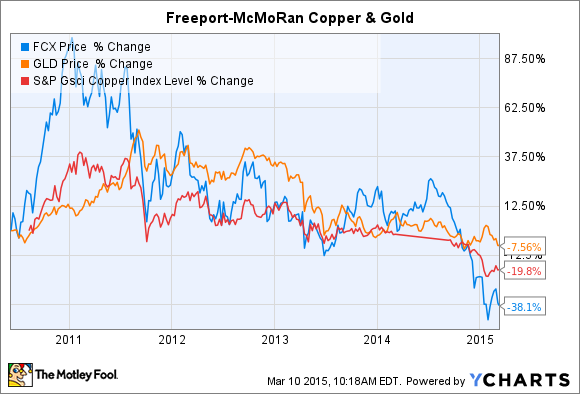 Image: Freeport-McMoRan Copper & Gold. The list included a number of companies that many might not be surprised to find on it. Kenneth Chenault from American Express (NYSE:AXP) came in 19th with $21.8 million in total compensation and $9.7 million in excess pay; Lloyd "We're Doing God's Work" Blankfein from Goldman Sachs (NYSE:GS) was 35th with $19.9 million in compensation, an excess of $8.2 million; and Cablevision's (NASDAQ:CMCSA) James Dolan was 47th with almost $16 million in compensation, a $4 million overage. But the top-ranking mining firm beat out all those notorious high-flyers -- it actually placed third on the list, behind only Nabors and Oracle. So, which mining CEO tops the most overpaid list? Richard Adkerson at Freeport-McMoRan Copper & Gold (NYSE:FCX) with more than $55.2 million in total compensation -- an excess of over $43.8 million of what should have been paid if compensation were actually related to performance. According to As You Sow, only Nabors and Freeport received the maximum number of "red flags" when certain factors were taken into consideration, such as how institutional investor groups evaluated them, how shareholders voted, and academic studies that were conducted. The survey does note that Freeport ended up cutting its executive chairman's salary in half last year in response to shareholder ire. That's a start, but it may not be enough. In January, Freeport-McMoRan reported its full-year earnings for 2014 showing that although revenues were up 2% last year, operating income was virtually wiped out as it fell from $5.3 billion to just $97 million and net profits of $2.6 billion in 2013 turned to a loss of $1.3 billion. Exposure to both metals and oil proved too much of a burden to shoulder in the current market and investors will undoubtedly like to see CEO Adkerson shouldering some of it as well. Companies need to have a more long-term vision of what constitutes a healthy but reasonable rate of executive pay in exchange for ensuring the long-term viability of the business. It's the CEO that must be accountable for that yardstick, but it's up to investors to hold the board of directors accountable for exercising their fiduciary responsibility in effectively managing shareholder resources.